By Mike Davenport. Working with rowing equipment is one of the most critical tasks for any rowing coach. But how do you do it safely, correctly, and effectively? What’s the secret to not only rigging rowing equipment but getting the most out of it? 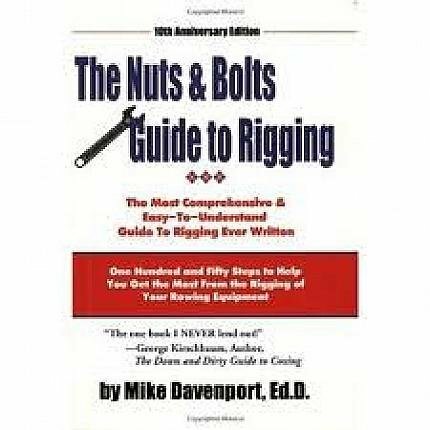 This book the Nuts and Bolts Guide to Rigging answers those questions, and many more. IN THIS BOOK YOU WILL DISCOVER: - How to use this book. - The best ways to buy and use rigging tools. - Methods to rig almost any type of rowing equipment. - How to identify rigging problems. - Methods to solve rigging problems. - How to find answers to your tough equipment questions. - Ways to ensure your rigging solutions will work. - How to buy, store, and maintain rowing equipment. - Suggestions for finding your rigging numbers. Please note, DVD's, Books, and Videos cannot be returned.